This furniture has remained at my parent's house since I moved out, but it was finally time to get that spare room decorated the way my mom wanted it. I have many fond memories of this set, so I was happy to become the owner again. The set also includes a nightstand and headboard/footboard that I haven't gotten yet. 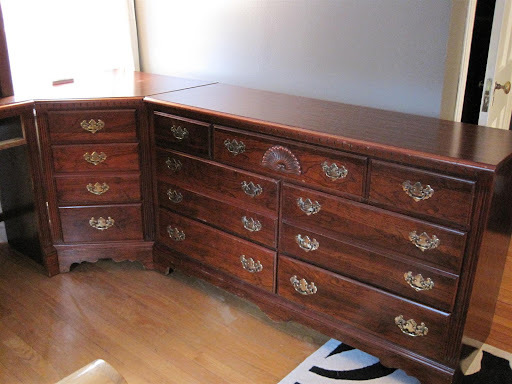 I am definitely not digging the cherry look from 1990, so my plan is to prime and paint these three pieces out in a creamy white and use it in this room as an office set with extra storage. It is a mix of laminate and wood (which is why I'm all about painting it), so we'll see if the BIN primer is as amazing as I hope it is! I do have the desk area drawer somewhere in the house, whoops on taking the photo without that! The hutch is removable and I don't believe I will use it since it makes the set look 'younger' than I'd like. 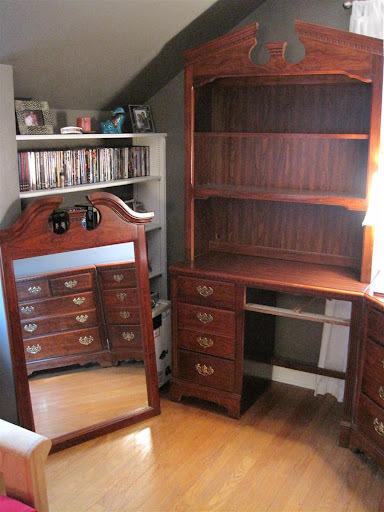 I also will be using the mirror that attaches to the dresser somewhere else. I think with some new hardware this set will look fresh and clean, and maybe someday I will give it to my daughter. Wish me luck on this project! Oh, that furniture will look awesome with some paint and new hardware. Good luck! Looks like you have quite the painting project on your hands; I'm sure it will be amazing! Can wait to see it!